E-portfolio Life by @cwilsonspanish is licensed under a Creative Commons Attribution 4.0 International License. Based on a work at https://peachylynn08.files.wordpress.com/2016/09/4197274.jpg. Permissions beyond the scope of this license may be available at cwilsonspanish.com. 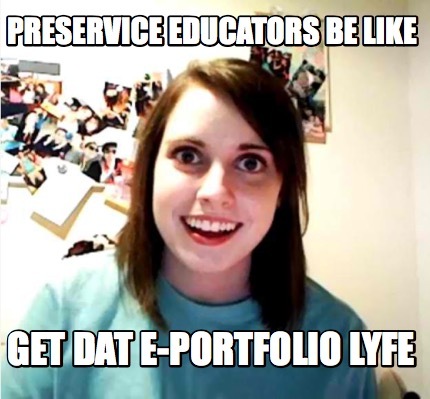 I’m not sure other professionals are as qualified to discuss and analyze e-portfolios in the same way that educators who have graduated college (of any level) in the last ten years are uniquely qualified. During my undergraduate degree I went through a number of e-portfolio initiatives put on by the State of Florida in an attempt to ensure we were actually educating our preservice teachers. Now, in my Master’s degree here in Texas, I am going through it again. I have an e-portfolio for the university, and separate e-portfolios for different classes, and one that has run the course of a few classes with the same professor. And of course… there is the e-portfolio that never died. This one. That is right! This blog began 6 years ago as part of an e-portfolio initiative in a class I was taking at the University of South Florida. What it turned into is even more than what was intended, I’m sure. This blog has turned into my teaching happy place. This has become a place that I voluntarily go (at the bequest of no one) to reflect and vent and innovate. At the creation of this blog, I hoped no one on the internet would stumble upon it. Now, I check my app every day to see if anyone did. I’m not famous. I haven’t gone viral. However, I’ve had views from all over the world and I’ve had amazing conversations with students and teachers who found my blog while scrolling on social media. Not only does this blog serve as a learning tool for me, it serves as a piece of authentication to the students who may come across it: Mrs. W is a real teacher, really trying, really learning, really failing, and really continuing on the path. I’m not there for the paycheck. And, I’ve got a weekly post to prove it. All these thoughts bubbled to the surface this week while reading over a section on authentic assessment and the use of e-portfolios in Web 2.0: New Tools, New Schools. E-portfolios can (and should) become more than just a collection of worksheets and assignments. As in the case of educators, they can become a useful and fluid curation of resumés, philosophies, unit plans, resources, ideas, and more. The idea behind authentic assessment is that our assignments lend themselves to real life, or in my case, my actual classroom setting. More importantly, e-portfolios in a Web 2.0 world have another capability: they can aid the learner in reflection. While my blog does curate some of my trials and failures, it mostly houses my reflective practice. This space holds me accountable to my integrity both as a teacher, and as a life-long learner. Creating spaces where learners can authentically showcase their work, fluidly revise and edit that work, collaborate with others on it, then return for reflective practice… this is the gold standard in learning. How can a learner who does all of those things not learn at a high level? Thanks for coming along for the ride.